When the moment comes to pull yourself out of the comfort zone, you may occur in the chaos of thoughts. What is the best option for me? What are the risks? How do I know that this will work for me? Sure, you can receive professional consultancy from a job coordinator. It may surprise you a bit if I say that you can be a better advisor for yourself. Who else perfectly knows what you can do or not? You should spend some time sorting out those chaotic thoughts and finally clarifying ways that drive changes. This article will particularly focus on online tutoring as a driver of changes for those mothers who have stuck in a housewife role for a couple of years. It will also be useful for students who lack enough experience or for job hoppers who are tired from the office work. Is there a teacher in you? Sometimes teachers who spend the half of their lives tutoring, discover they are better with decorating living rooms. Unfortunately, when we come into a particular comfort zone, we can’t even assume to ask this simple question. I suppose a real teacher should always revise own tutoring skills that do not comprise academic background in the first place. Certainly, you should get involved in online tutoring having enough patience, ability to listen, desire to share, readiness to spend more time on the preparation than a lesson lasts. If you want to become a professional tutor and have a long waiting list of students, you need a certificate that allows teaching the subject of your expertise. For instance, if you’ve already spent four years in college and got that certificate but have practised, you could enter a special course for teachers. There you will get practical lessons and methods how to engage learners with a systematic approach to studying. The community of online tutors is huge, and they are united by different online tutoring services. For example, if you visit Preply, you’ll see that it gathers tutors with different price tags. There are a few factors that influence charges. Among them, we single out an origin of a tutor (naturally, natives earn more than non-native teachers), a degree (the Master’s makes the most), experience (1+ year is just preferable), reviews from current or previous learners (particular bonuses to your profile that true teachers earn with their daily performance). This is far from simple lesson planning. Make a detailed picture in your mind how a good lesson should be built. Don’t try to recreate a perfect lesson. Judging from my own experience, there are no such. There will always be some points in presenting material which another tutor would criticize or redo. However, this isn’t a reason to mimic methods of others or regard yourself a pathetic tutor. The methodology can be shared, but approaches always differ. Hence, do not get tired to replicate each lesson and come up with new techniques to deliver your lessons. Online tutoring is dissimilar to traditional in-class lessons. Many tutors of an old school fail to keep a contact and show their full potential having a Skype lesson. It is explained by the fact that lessons you give online require even more preparation since you can’t just use a whiteboard to assist you with explanations and other training activities. Which is why it is better to practice and detect all the bottlenecks on trial lessons you could give to one of your friends or relatives. It may sound like a waste of your time, but it will add you more confidence which is invaluable for the tutor’s reputation and success. To substantially decrease the preparation time, tutors should form a list of those tools and sources that would support their lessons. Not only it simplifies the whole process, but it also engages learners because today tutors mostly deal with Z-gen students. These learners are known for their impatience and ignorance to conventional ways of studying. They expect to absorb new information through familiar sources and ways of receiving data. Hence, it’s better to use all the tools that will capture attention and warm up an interest in such students. One of such is interactive video-based lessons with quizzes and training games. If you still wonder how the ways mentioned above can generate income, then I should make a summary. All these stepwise guidelines are the part of your tutoring strategy which will generate more potential learners interested in your high proficiency. Hence, a tutor who always works on own performance will make a regular income growing an audience of students. Note: This article may include some third-party links. All content in the links belongs to their creators. Very informative. You have covered important points regarding Income from Online Tutoring. Yes, it is really important to update yourself as a Tutor. But I have one question for you- How to choose the reliable platform to learn from? As there are multiple learning platforms and each has different sort of knowledge. There is so much demand of online tutoring these days. Many students prefer learning online rather than going to tuition centre. The main reason behind this is every student want to learn at their comfortable place and according to their suitable timings. 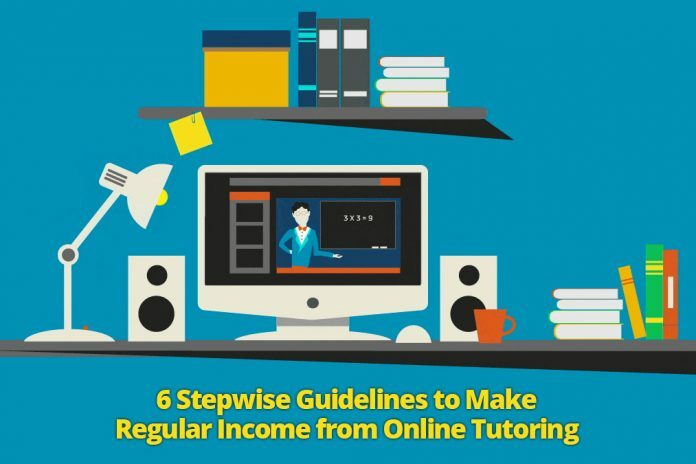 So, I online tutoring is the best option to earn income sitting at home. Thanks for sharing nice and useful information!